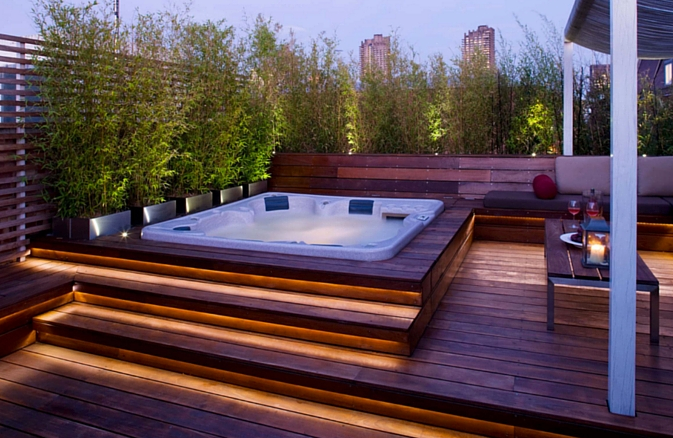 Some people worry that hot tubs are difficult to maintain– this is not the case at all. In order to keep your hot tub in perfect condition, you simply need to perform a few easy maintenance tasks on a regular basis. Hot tub maintenance doesn’t require a lot of time. Spending a few quick minutes on hot tub maintenance will increase your enjoyment plus, continued maintenance adds to the longevity of your spa. 1. Sanitize the spa: Keeping your hot tub properly sanitized will prevent any sort of unwanted contaminants. Granular chlorine or bromine are the best sanitizers. Maintaining the sanitizer levels in your spa is easy. Simply check periodically to make sure levels are within acceptable limits with a test strip. 2. Clean your filter every month: Remove the filters and clean by spraying them off with a hose and nozzle or other high-pressure water stream. Work each pleat from top to bottom. 3. Drain and refill: Your water will not stay fresh and clean forever, even with proper maintenance. It is best to drain and refill your hot tub every 3 months. Follow the instructions in your Owner’s Manual. 4. Skimmer Basket: Check and clean the skimmer basket once a week removing leaves and debris to ensure proper filter flow. 5. Protective Cover Care: Your hot tub cover is exposed to the elements and can be damaged by UV rays, dirt, and stains. Protect your cover and extend its life by using a vinyl protector. Place tennis balls into the skimmers – or directly into the water – to attract bodily oils, hair products, lotions, etc.from entering the filtration system. Change them as necessary depending on the bather load. Hot tub covers can produce a musty or mildew smell after a while. That’s why it’s important to keep your cover clean and free of these foul odors. Use a small amount of bleach (10%) added to water (90%) and wipe down the bottom of the hot tub cover every 90 days. This will help prevent your cover from getting that musty smell that everyone dislikes. Keep your hot tub covered when not in use. Covering up your hot tub at all times will keep harmful UV, extending the life of your sanitizer. We would love to hear your feedback. Do you have other tips?